The best evidence in Jewish law must be attested by at least two witnesses, and be of a disinterested and impartialcharacter; hence self-admission, or voluntary confession, is not good evidence, and is not admissible except in the cases mentioned below. Admission in criminal cases is entirely excluded, and is not even considered in evidence. 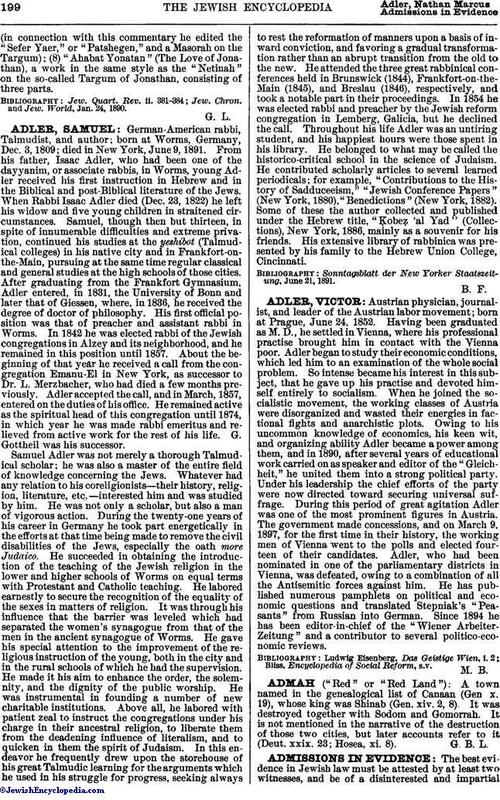 Applying the Talmudic maxims ("Each man is his own near relative")—relatives can not bear witness against one another—and ("One can not incriminate himself"), the Jewish legislators probably thought by this means to prevent the methods prevailing in their times of extorting confessions by torture. The Talmud, endeavoring to give a legal aspect to the conviction of Achan on his own confession (Josh. vii. 10-24), has the following haggadic explanation: "Joshua pleaded before the Almighty: 'O Lord of the universe, tell me who is the man?' God answered: 'I do not divulge the secret of any person; furthermore, I am no informer. But go and make investigation among the tribes and families.' When Achan, the son of Carmi, was 'taken' he protested against such a method of conviction: 'Has not Moses our master taught us, "at the mouth of two witnesses, or three witnesses, shall he that is worthy of death be put to death "?' (Deut. xvii. 6). Joshua then spoke persuasively to Achan: 'My son, I pray thee, make confession.' Achan finally confessed, 'Thus and thus have I done'; and when his confession was substantiated by the finding of the property concealed 'in his tent and the silver under it,' this made the conviction legal" (Yer. Sanh. vi. 23b). "Replying to your inquiry: According to our laws, one who has sworn that he will do a certain thing and afterward admits, 'I have broken my oath and not done as I have sworn'—which fact could not be established by witnesses, but solely by his own admission—does not become thereby a disqualified witness for future cases, as the rule is, 'a man cannot incriminate himself,' and this person who took an oath to enter the accounts in the book justly, truthfully, and to the best of his ability, and now admits false and fraudulent entries, is not to be regarded a perjurer by law, inasmuch as it can not otherwise be proved that he has presumptuously broken his oath. However, should you think it advisable and proper to inflict a punishment on him for contempt and barefacedness for saying that he has broken his oath, you may act in accordance with your discretion. "Asher, son of Jehiel of blessed memory." Admission involving the guilt of another person is valid, though not operative against the person making it, as in the case of unnatural offenses (Sanh. 9b et seq.). Raba's rule in this case is ("We split the testimony"), the first part being excluded; otherwise the maxim is ("Testimony partly annulled is all annulled"). Admission effecting one's own loss is regarded as good evidence, the maxims concerning criminal cases being reversed: ("One is not related to one's money"; Sanh. 10a et passim), and therefore man may testify against himself in civil cases and ("The admission of the defendant is as good as a hundred witnesses"; Tosef. B. M. i. 10 et passim). The only benefit one can derive by one's admission is to save an extra fine; as in the case of a person admitting seduction, who must pay damages for degradation and impairment, but need not pay as a fine the amount of the legal dowry (Ex. xxii. 16, Shebu. v. 4, Ket. 42a). Similarly, in the case of a thief; if he admits his guilt, he must make restitution for the stolen property, but need not pay the fine of double, four, or five times the amount of the theft, as the case might otherwise require (Ex. xxi. 37, xxii. 3): provided, however, that the admission was made before the bet din, or court, and before he was sued and evidence was produced against him; otherwise his subsequent admission is of no avail to release him from the fine (Maimonides, "Hilkot Genebah," iii. 8, 9). Admission of a debt must be made before two men expressly requested to serve as witnesses on this particular point; otherwise, if stated in the absence of the creditor, the debtor can claim that the statement was made for the purpose of making people believe he was poor. Then, again, if the creditor was present, the debtor can claim that the statement was made in fun, ("I have been joking"). In fact, the debtor's silence to the creditor's demand, before witnesses, is a better indication of his consent than his admission under these circumstances. The best safeguard for the creditor is to have the debtor admit his indebtedness after due demand in court, when the debtor can not have recourse to any such excuses (Sanh. iii. 6, 29a; "Shulḥan 'Aruk, Ḥoshen Mishpaṭ," § 32). 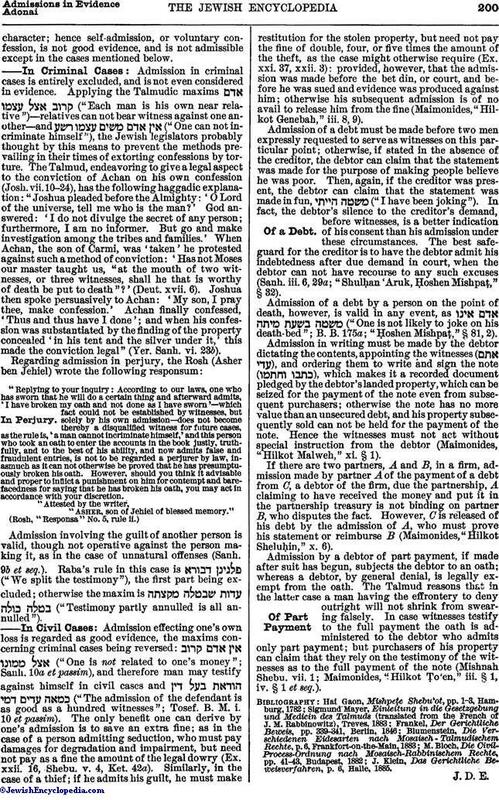 Admission of a debt by a person on the point of death, however, is valid in any event, as ("One is not likely to joke on his death-bed"; B. B. 175a; "Ḥoshen Mishpaṭ," § 81, 2). Admission in writing must be made by the debtor dictating the contents, appointing the witnesses ( ), and ordering them to write and sign the note ( ), which makes it a recorded document pledged by the debtor's landed property, which can be seized for the payment of the note even from subsequent purchasers; otherwise the note has no more value than an unsecured debt, and his property subsequently sold can not be held for the payment of the note. Hence the witnesses must not act without special instruction from the debtor (Maimonides, "Hilkot Malweh," xi. § 1). If there are two partners, A and B, in a firm, admission made by partner A of the payment of a debt from C, a debtor of the firm, due the partnership, A claiming to have received the money and put it in the partnership treasury is not binding on partner B, who disputes the fact. However, C is released of his debt by the admission of A, who must prove his statement or reimburse B (Maimonides, "Hilkot Sheluḥin," x. 6). Admission by a debtor of part payment, if made after suit has begun, subjects the debtor to an oath; whereas a debtor, by general denial, is legally exempt from the oath. The Talmud reasons that in the latter case a man having the effrontery to deny outright will not shrink from swearing falsely. In case witnesses testify to the full payment the oath is administered to the debtor who admits only part payment; but purchasers of his property can claim that they rely on the testimony of the witnesses as to the full payment of the note (Mishnah Shebu. vii. 1; Maimonides, "Hilkot Ṭo'en," iii. § 1, iv. § 1 et seq.). J. Klein, Das Gerichtliche Beweisverfahren, p. 6, Halle, 1885.